A deadly Ebola outbreak in eastern Democratic Republic of Congo is deeply worrying, but does not yet merit being labelled a global health emergency, the World Health Organization said Wednesday. The latest outbreak -- the 10th in DR Congo since Ebola was first detected there in 1976 -- emerged in the highly-restive northeastern region of North Kivu, which is home to a clutch of armed groups. So far, 216 cases have been reported, including 181 that have been laboratory confirmed. A total of 139 people have died, meaning the fatality rate stands at 64 percent, WHO said. "The emergency committee had a consensus that this outbreak certainly is not an outbreak of global importance, but they are very concerned for the region," Steffen said. The committee determined though that DRC authorities and the international community were already responding robustly to the outbreak, and that Uganda was well-prepared if the virus spreads across the border. The use of an experimental vaccine is also promising, with more than 18,000 people having received the jab to date, WHO said. 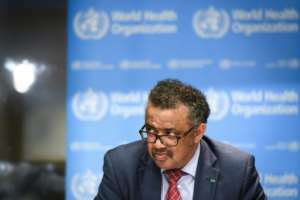 "I think the vaccine is helping," Tedros said.